Join the Facebook Group to access the Event Groups. Atheaholics Anonymous. 18th September, 6:00pm, Greenbank Lecture Theatre then the SU Source Bar. Come and meet everyone at AHSUCLan, whether yours is an Atheist Ale, Humanist Hops, Secular Spirits, Reasonable Rum or Coke everyone is welcome. We’ll be voting in some new committee members and outlining what’s happening this year, as well as most importantly helping you guys to realise your ideas – Join Facebook Event. The Unbelievers with Richard Dawkins and Lawrence Krauss. 24th September, 6:00pm, Greenbank Lecture Theatre, UCLan, Preston. FREE – Join Facebook Event. CFI UK Conference – God, Religion, and the Bible, with Francesca Stavrakopoulou, Keith Ward, and Stephen Law. 19th September, 10:30am – 3:00pm, Conway Hall, London. Purchase own ticket and travel – Join Facebook Event. Festival of the Spoken Nerd – Just For Graphs. 25th October at 8:00pm, The Lowry, Salford Quays. Purchase own ticket (£18), leaving from outside the SU – Join Facebook Event. Helen Arney has even kindly agreed to let us publicise the society at this event! Richard Dawkins. 26th October at 8:00pm, The Lowry, Salford Quays. Purchase own ticket (£16), Sean is driving, leaving from outside the SU at 6:00pm – Join Facebook Event. Tehmina Kazi – Secular Muslims: The Importance of Building Inclusive Religious Spaces. 16th November, 6:00pm, Greenbank Lecture Theatre, UCLan. FREE for members, £3 for non-members to cover speaker’s travel cost. – Join Facebook Event. Welcome to the website of the Atheist, Humanist, and Secularist Society at The University of Central Lancashire (AHSUCLan). To find out more about who we are and what we’re all about read the “About” section of the website and get in touch with all your fellow students in our Facebook Group. Make sure you join at the SU, and follow us on Twitter, checking back for updates on future events regularly. Our events and activities all have a quirky AHS slant and include: Socials, seminars, TV appearances, workshops, conferences, debates, campaigning, lectures, charity, comedy, personal and professional development training, national and international events, a skeptics library, publishing, and anything else you can think of! Last year we helped to raise £2374 for the Ugandan Humanist Schools Trust, whilst also raising money for Alzheimer’s Research following Terry Pratchett’s death. We also worked with UCLan’s Chaplain to allow Humanist Celebrants onto campus to provide student pastoral support, funerals, naming ceremonies and weddings. On top of this we got UCLan’s library to stock more AHS related material, held a successful Skeptics week, and much more. This year we hope that we can provide the same vibrant and supportive atmosphere, as well as an exceptional array of events and opportunities for students in the 2015-2016 intake – we’re really looking forward to hearing all of your ideas too! 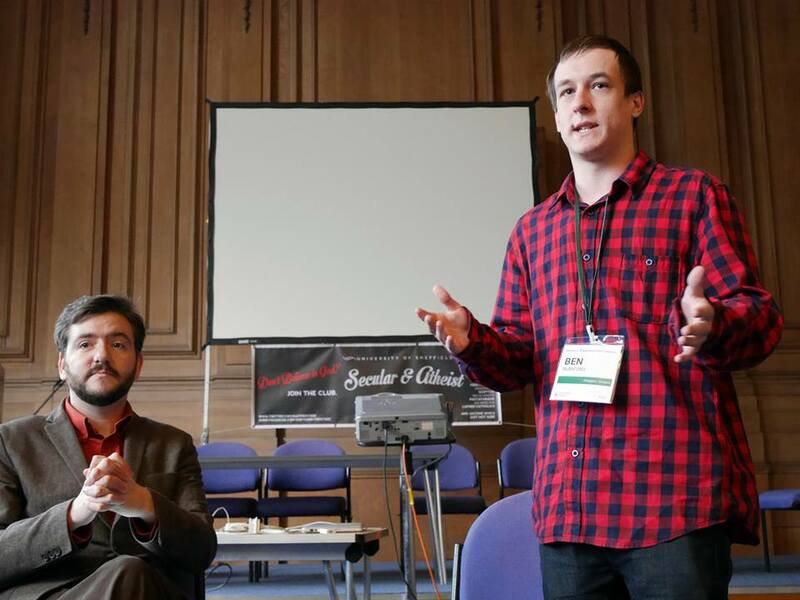 Last year we met our Chaplain at one of our events during Skeptics Week. He really enjoyed one of our talks, and following that we met up for coffee to see if we could sort out a Lancashire Secular Humanists Celebrant on campus. Good News! Don’t do god? Niether do we, but we still do student support and now we can provide that on campus, as well as any number of services you might never have thought of. If you would like to meet the Humanist Celebrant on campus then please contact Andrew Clitherow at the Multifaith Centre. In a less official capacity if you don’t do ‘god’, but still need support, then AHSUCLan might be for you. Come along to one of our meetings or simply get in touch with a member if you’re going through a tough time at uni, and see what a little peer support can do. We have helped many people of faith and none, including ex-Christians and ex-Muslims, who now call our little AHSUCLan group home. We hope we can help. Hi everyone, we founded the society in 2014 after a successful event called ‘An Evening of Science and Reason‘ to cater to everyone on campus who is interested in all matters skeptical! I’m a neuropsychology research student, senior research assistant in clinical practice, and senior demonstrator/associate lecturer in the Psychology Department at UCLan, as well as a regular speaker at skeptical events up and down the country. I’m passionate about engagement in science, equality, free expression, education and ethical decision making in order to promote a more enlightened society. Before coming to UCLan I was a serving soldier and communications liaison in the Middle East, and I’m now active in many areas of social and political activism. It’s my job to enable and facilitate your ideas so that we can build an inclusive, cohesive, engaging and interesting society for all! I am a first year Neuropsychology student at the University of Central Lancashire and have been passionate about science for as long as I can remember. After spending several of my teenage years actively involved in a Pentecostal church, I eventually left (after being heavily encouraged to leave) because I refused to deny evolution. Ever since I have been obsessed with the power that religion has in society, the factors which contribute to the formation of religious belief and the idea we are evolutionarily adapted to become both leaders and followers. I’ve also had a fascination with alternative medicine and pseudoscience ever since I realised the Berlin Wall could be purchased as a homeopathic remedy (or Murus Berlinensis if you’d like its more official sounding name). It was a great privilege to be able to volunteer for Project Science and Reason and I’m looking forward to being able to work with people so passionate and dedicated to science. This page details all of our AHS related publications that are available for members. 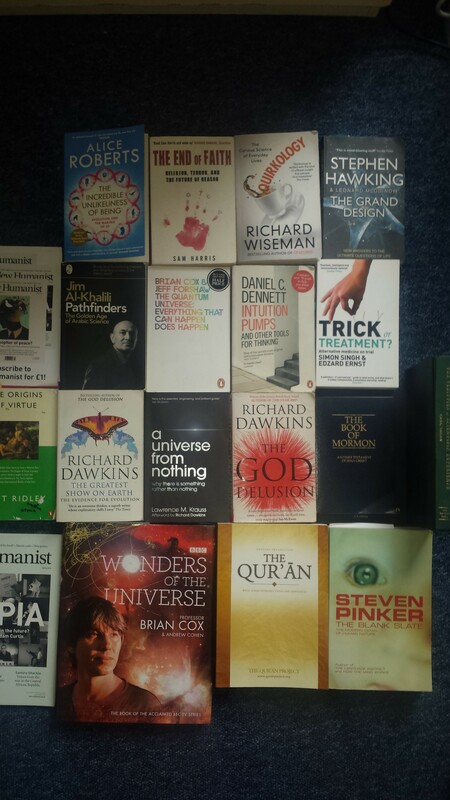 In 2015 we even successfully petitioned UCLan’s campus library to stock more AHS related material! If you would like to check-out a book from UCLan’s library then simply visit the library with your coporate card and use their loans system. If you would like to borrow or list a book of your own in AHSUCLan’s library then please contact a committee member, or the individual who has listed their books as available to loan. AHS UCLan: A review of our first year! Ever since its inception last September the UCLan AHS has been having a very busy year indeed! 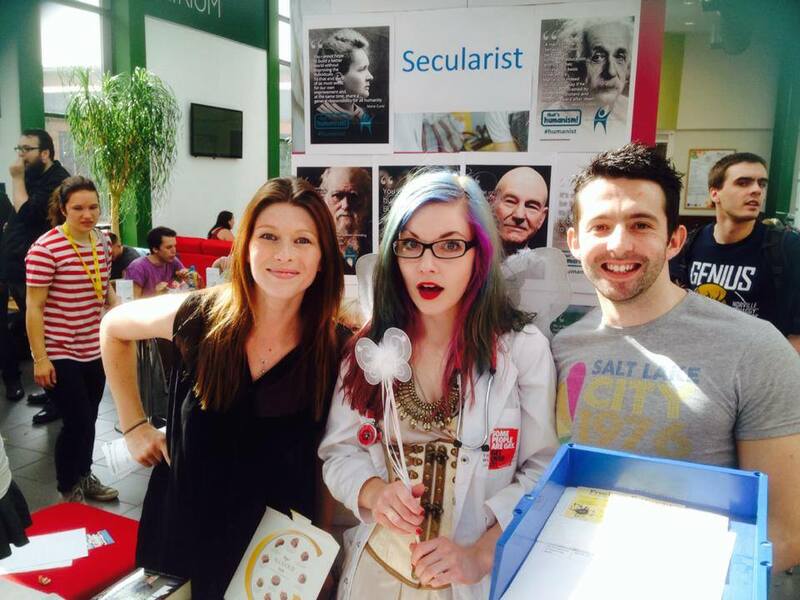 First up was fresher’s week recruitment in the atrium where Glen, Mel and Hamza were able to reel new members in with our colander dedicated to the flying spaghetti monster, evolution home brew and our own resident medical fairy Mel! Following this for the remainder of September and beginning of October we continued to busy ourselves with ‘Atheaholics Anonymous’ where we elected our committee followed by a trip to the pub and singing skeptics karaoke at Roper hall (again for the umpteenth time James and I are sorry for murdering uptown girl at karaoke). 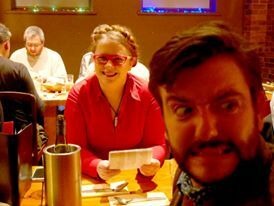 We also managed to establish our collective society persona for pub quizzes Yolo Swaggins and the Fellowship of Da Bling! After this we had our first piece of collaborative work with the regional AHS societies across the country when we took part in non-prophet week to raise money for the Uganda Humanist Schools Trust. Along with other AHS societies across the area we managed to raise £2000 pounds. This was a brilliant success that we were more than happy to contribute towards. 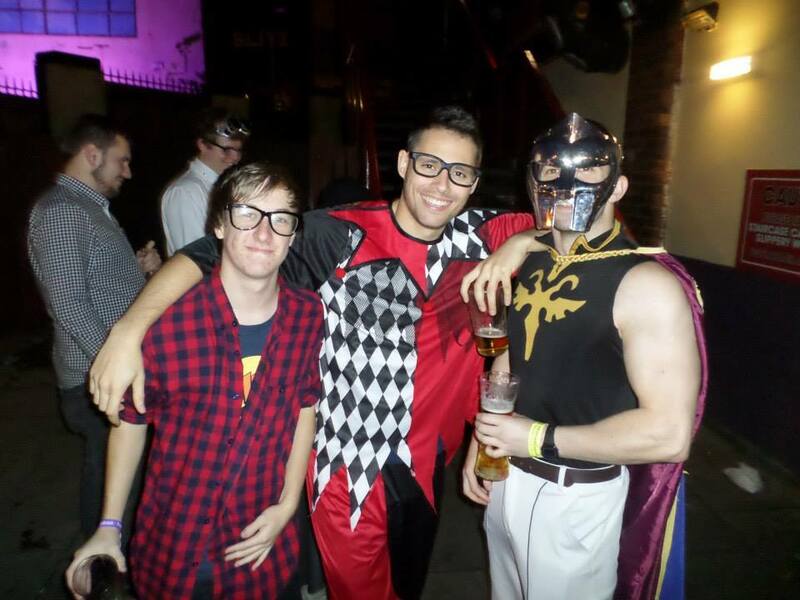 Then it was time for our Happy Humanist Halloween! (We know that we have a thing for wordplay but we love it!) 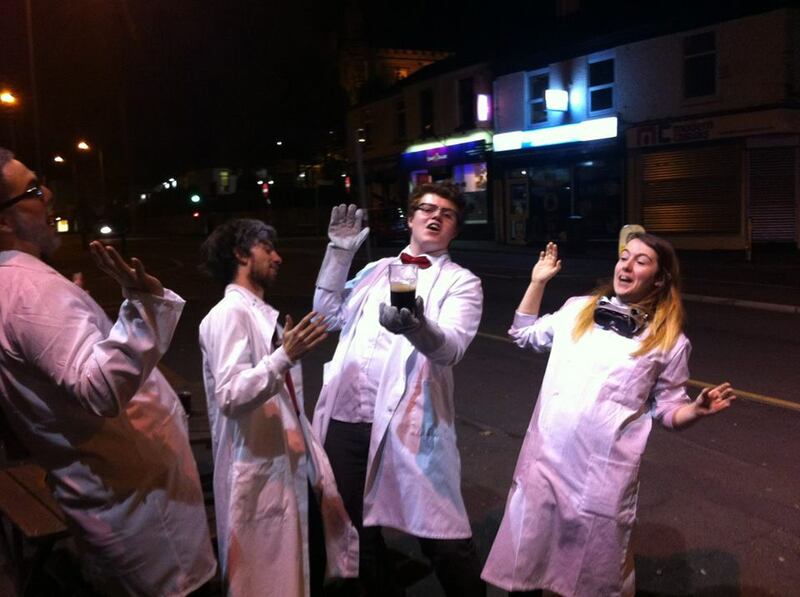 We hit the Preston nightlife completely dressed up in our wacky costumes including a quartet of mad scientists, a jester and even Garth Algar from Wayne’s world! Afterwards November rolled in and it was time to really get down and into business with our planned lectures on elements of scepticism, science and many other wonderful topics our members and other within the university were keen to see! Members of the outside public even came to attend! First up it was Dr Andrew Pyle who gave us a wonderful talk on the battle between science and religion; whether it actually exists and what it entails. To cap off November we then had a showing of the movie Exposed: Magicians, Psychics and Frauds. A wonderful movie about the magician, escape artist and illusionist The Amazing Randi. The film took us through his personal life and his quest to debunk frauds who were using skills he used himself as an entertainer but passed them off as real in order to achieve more fame and riches. Suffice to say that the movie was thoroughly enjoyed by everyone that showed up. 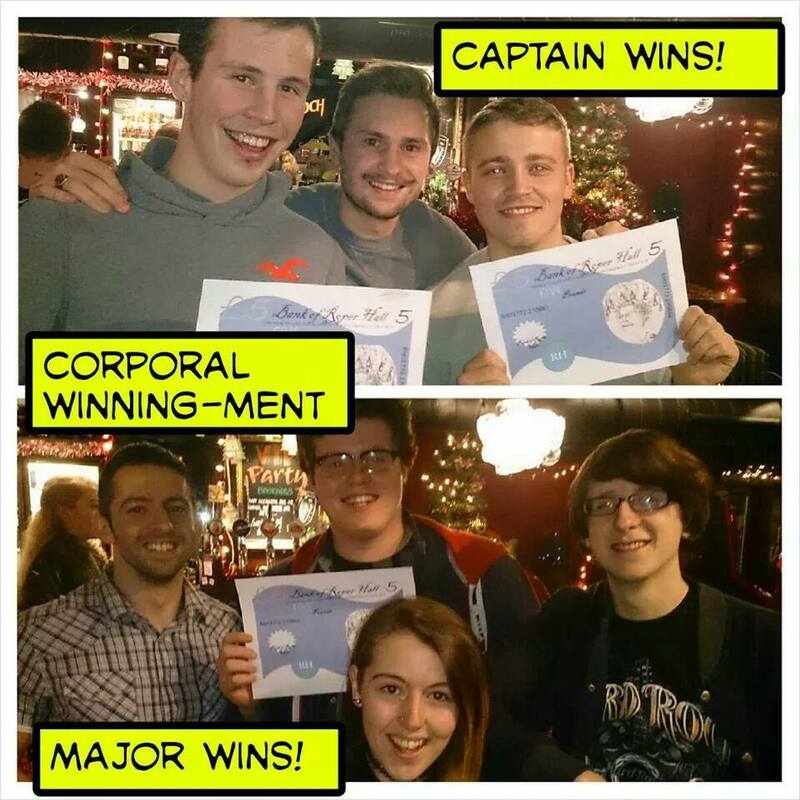 weeks AHS UCLan had its first big multi-society event to go to! The AHS training conference held in the Portland building of the University of Nottingham. Glen, James, Ben and I drove up to Nottingham for a weekend of brilliant training seminars hosted by the likes of Andrew Copson, Caitlin Greenwood, Chris Malburn and Martin Smith. Then as night came we were all able to head out into town and socialise. We made a lot of wonderful friends that weekend who we’ve now been able to engage and talk to over social media and other events since! Following this the end of February marked our biggest AHS conference event to date when Glen, James, Ben, Phil, Alex and I hopped down to Sheffield for their universities first ever Freethought Convention organised by the marvellous Sylvia Broeckx. We spent our Friday night and weekend engaging with those that we had met at Nottingham again as well as some new faces including renowned atheist speakers and authors such as David Fitzgerald and Amal Farah. I know that I for one was genuinely sad when the weekend was over, I just didn’t want to leave! Following this we received the devastating news of the death of the amazing Terry Pratchett when he lost his battle with Alzheimer’s disease. A true paragon of humanism and a staunch advocate of the Dignity in Dying campaign deserved a memorial and that’s exactly what we did! Within a week we had organised a reading of Terry’s 2013 Humanist of the year speech by Glen followed by a showing of Terry Pratchett: Shaking hands with Death and The Colour of Magic. It was a moving night and in my opinion a fitting send off to such a great man. We also collected money from attendees at this event for Alzheimer’s Research UK as a token of our respect to Terry and to continue the fight against Alzheimer’s despite his passing. Post-Sheffield UCLan AHS still had plenty to offer with our first annual Skeptics Week kicking off shortly after Easter! We had a debating workshop with Glen, a lecture on green chemistry from James Smith and Emma Lowrie gave us another side of the story with her talk on the psychological benefits of belief. This really gave our members to improve on their skills related to public engagement which has been a large aim of our society right from the start. On top of this we also had Chris Moos giving his talk: From Jesus & Mo to Charlie Hebdo: Being a secularist in the face of the religious far-Right and the pro-religious Left. Every single talk that week was wonderful and Chris’ was just the icing on the cake, we loved it! Then to wrap it all up James and I made our way down to Ships and Giggles on the Saturday of Skeptics week for a charity waxing… needless to say it hurt; but the pain was worth it to raise even more funds for Alzheimer’s Research. AS exam season rolled in and everyone found themselves strangles by increased exam time stress the AHS still managed to provide for its members with Chloe sorting out a cocktail night in Ships and Giggles. A couple of free drinks and entry into Macs was just what some of us needed to unwind and get our heads out of the books for a night. However Phil and Glen were still more than willing to hit the nationwide stage with not one, but two appearances on the BBCs: The Big Questions! It was wonderful to see some representation from our society live on national television. And so there it is… an account of everything our society got up to in its very first year. I for one think we did a brilliant job of really getting our name out onto the stage both within UCLan and throughout the country! Now all that’s left is to get ready for the new academic year! Don’t forget to come down and check us out at fresher’s when the societies fair is on we can’t wait to see some new faces! 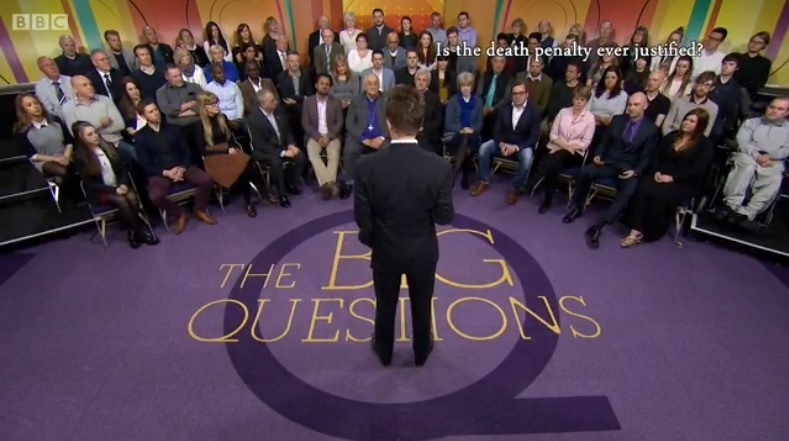 Sunday was an eagerly anticipated experience as myself and Glen were at the Pyramid and Parr Hall, in Warrington, to sit in the audience for two episodes of The BBC’s The Big Questions – a show I had, myself watched for quite some time. 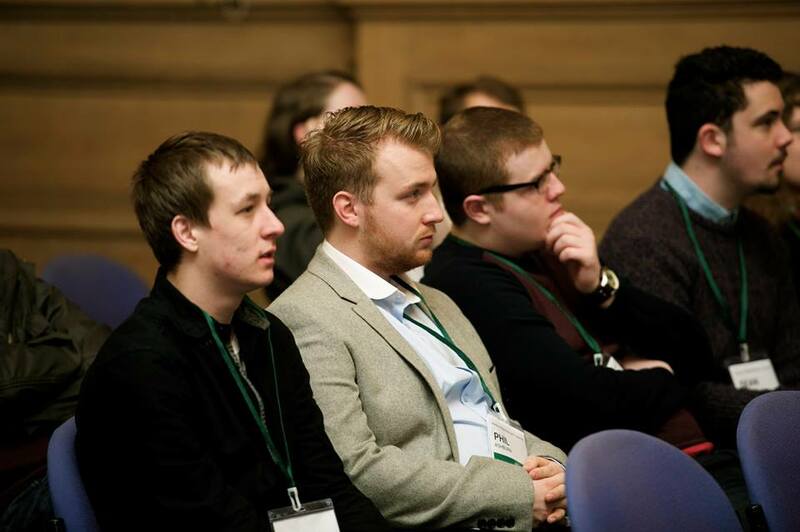 This was one of those occasions where you are sat, two rows behind the likes of Andrew Copson, Peter Tatchell, and Maryam Namazie, watching them being pounded with questions by the brilliant Nicky Campbell, and you realise these are the tremendous opportunities that present themselves when you are at university, and especially part of a society. When you are passionate about something, the best thing you can do is get involved. It soon becomes apparent that there are others just as passionate and some even more so. You realise your arguments are flawed, your opinions can be changed and you can disagree with and be disagreed with, by people who share the same passions as yourself. This is vital in broadening one’s horizon and developing one’s arguments. Indeed, you do not go to university to hear people who have the exact same opinions as yourself.